Moorcroft Ashwood Medal of Honour Discounts Apply ! The ‘Ashwood Medal of Honour’ vase celebrates the achievements of nursery owner John Massey who was awarded the Victoria Medal of Honour by the Royal Horticultural Society in 2010.. The flower chosen by Emma for this particular vase was of course the hepatica so important to Ashwood and Moorcroft alike. The creamy background enhances the pale mauves and liliac of the flowers, whilst below there are swirls of vibrant green foliage. 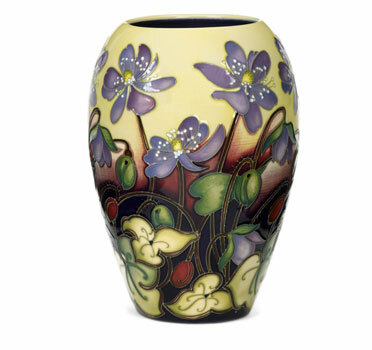 All in all this is a perfect vase for a Moorcroft collector or anyone who loves flora!